​Our stated mission is to stimulate and promote the knowledge and love of gardening, to advocate for the natural beauty of our community and encourage the conservation of natural resources. In an effort to further enhance our community involvement, we set aside a major portion of our fundraiser proceeds each year to be spent on worthy community projects which meet our mission statement guidelines. Please visit our “Funding” page for further information and to download an application to request funding for community projects that follow the guidelines of our mission statement. In the spirit of community, our members create opportunities for everyone to appreciate the city with horticultural surprises in unexpected places. ​The High Street water trough at the intersection of High and Auburn Streets is adorned with seasonal plantings and holiday decorations throughout the year. Once located in Market Square, the trough replaced the "horse" drinking fountain in September of 1923. It is a pretty sight located just outside the Bartlet Mall Park. Thank you to an area resident for his generous donation to keep the trough looking especially beautiful in 2018. On Low Street under the Rail Trail overpass, our site is considered to be in its "environs." In September of 2011, weeds, some as tall as five feet, were pulled to make way for a new bed. Our members brought their own plants for the garden to supplement some purchased. Our "pot luck" event spruced up the area and now gives motorists a scenic view. Newly planted daffodils burst onto the scene in the spring of 2016. Every year new additions continue to enhance this site. 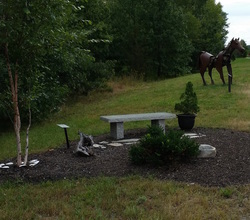 At the Rail Trail bird bath area, created in 2013, a three trunked river birch tree and boxwood were planted to complement the granite bench and bird bath installed there. Sitting low to the ground, it seems that dogs prefer it much more than the birds! A simple design was executed due to poor soil quality and the lack of water available in the area. This pretty site, between Low Street and the train station near the horse sculpture Clyde will only grow more lovely as the plantings mature. 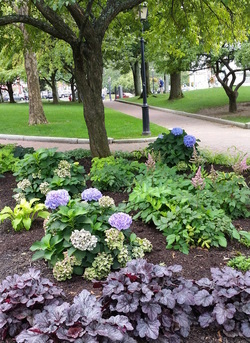 In 2015, the Society approached the Waterfront Trust Commission with a proposal to renovate and maintain two garden beds within the Waterfront Trust Park. This proposal was enthusiastically received and members designed and implemented a complete renovation of two existing garden spaces just behind the Firehouse Center for the Arts. These gardens were designed for beauty while keeping the view, summer concerts goers, and our visitors in mind. Showy hydrangea, hosta, astilbe, ornamental grasses, and ground cover add to the already beautiful surroundings. A third garden restoration was completed in 2016 after careful consideration, lots of trimming and, of course, weeding. Perennial additions have included Golden Spirea, ‘Caradonna’ Salvia, Cranesbill, Heuchera, ‘Brit-Marie Crawford’ Ligularia, and ‘Endless Summer’ Hydrangea. The Newburyport Horticultural Society has planted thousands of King Alfred Daffodil bulbs throughout the city during the last several years. Starting in the fall 2015, we initiated a daffodil planting project along the rail trail between High and Low St. This initial project was a memorial tribute to a former member, Ann Kemp, to honor her passing and love of daffodils. Since that time, additional yearly King Alfred Daffodil bulb planting projects have been undertaken at various locations. 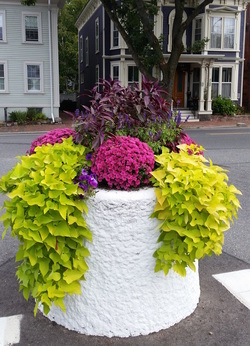 You will also enjoy these bulb plantings in front of the Newburyport Public Library, along the rail trail as it approaches the bridge by the Merrimack River and at March’s Hill. 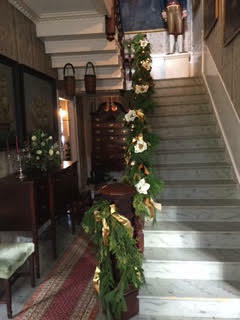 The Cushing House Museum on High Street is decorated for the holidays each year by several area garden clubs. Each group is assigned a space to decorate and volunteers gather on a December morning to transform the elegant home, both inside and out, with festive holiday arrangements and greenery. In 2015, members of the Newburyport Horticultural Society began in the task of creating holiday decorations for the annual Holiday Open House. Free to the public, this event occurs only one weekend in December at this National Historic Landmark.